Uranus is the first ice giant of the sol system and is also the least massive. 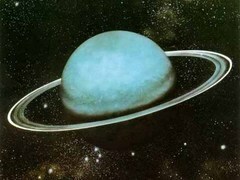 Uranus is a pale blue ice giant featuring 13 rings and over 30 natural satellites. Both Uranus and it's moons are composed largely of ices. It is most notable for it's extreme axial tilt of 98 degrees, almost parallel with the plane of it's orbit, and is the second least dense planet in the Solar system.